When it comes to money, the attitudes American consumers have towards money is a complex collection of contradictions. On one hand, everyone says they want to be rich, but they deride the rich as “greedy.” They say they struggle to pay the rent and make ends meet, but many also claim they’ll retire by the age of 45. Here’s what financial marketers need to understand about Americans’ views about money. 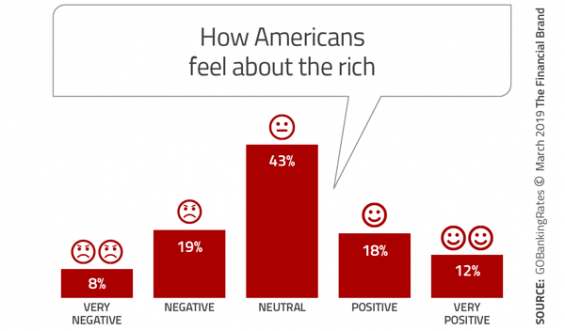 In the “Conflicted States of America,” many resent the rich, but would also like to join them. Financial marketers live and breathe money, and help sell what it can do. But do you really understand how other Americans, even yourself, really feel about it? But then you have Warren Buffet and Bill Gates and hundreds if not thousands of others among America’s wealthy who fund scholarships that send other people’s kids to college, and endow programs, entire schools, hospitals and much more. Add into this complicated mix the wealth gap — which is widening and has become a huge political issue. On balance you’d think that the public at large would skew negatively toward the wealthy. In reality, however it’s surprisingly balanced. 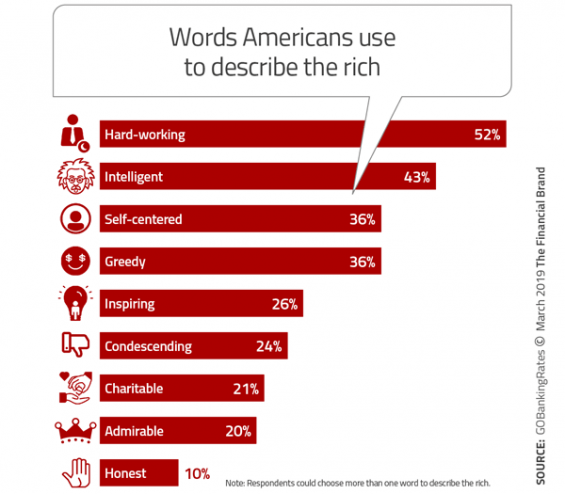 Asked by GoBankingRates how they would describe their feelings toward “the rich,” one out of five Americans (27%) say they have negative or very negative feelings toward them. 30% have positive or very positive views, and the rest, 43%, are neutral.